Moles are particularly unwelcome on the expensive turf of golf courses, bowling greens and other sporting venues. This is due to the unsightly mole hills made by the burrowing animals. These hills are not only unsightly but can cause damage to mowing machinery. Damage can occur in arable crops and gardens when moles burrow under seedlings and plants, resulting in wilting and death. 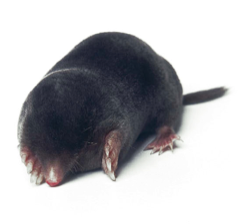 The control of moles is achieved by either trapping or gassing.